Equipping your organization for an uncertain future is a daunting task. If you’re already over-stretched dealing with the pressures of today – it can seem like an impossible one. But building future planning into your everyday practices is not only vital – it’s eminently doable. 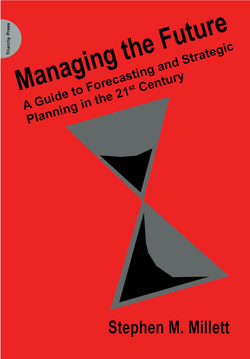 Managing the Future offers a straightforward and pragmatic approach to strategic planning. It takes an honest look at the limitations of forecasting, and shows (through real-life examples and a wealth of experience) how managers can best use a variety of futuring methods, including scenarios, horizon scanning and trend monitoring. Futuring Principle 1: The future will be some unknown combination of continuity and change. Futuring Principle 2: The future can be anticipated with varying degrees of uncertainty depending upon conditions. Futuring Principle 3: Futuring and visioning are different but complementary perspectives of the future. Futuring Principle 4: The best forecasts and plans are methodically generated and provide well considered expectations for the future. Futuring Principle 5: There is no such thing as an immutable forecast or plan for an immutable future. Forecasts and plans must be continuously monitored, evaluated, and revised according to new data and conditions in order to improve real-time frameworks for making long-term decisions and strategies. both intuitive and analytical scenarios for forecasting and planning. This is a guide for any public, private, government or non-profit organization that wants to update or improve its strategic planning capabilities, or to develop those areas of the organization that feed information and knowledge into the planning process. It is also the ideal introduction to the subject for anyone moving into a planning role. Organization design and strategic decision-making at the most senior levels.